Card Text After an enemy creature is destroyed fighting Mugwump, fully heal Mugwump and give it a +1 power counter. Does Mugwump’s ability work when it is attacked? Yes. Unlike a “Fight:” ability, which only resolves when a creature attacks, constant abilities are always active and resolve whenever that creature is fighting, whether it is attacking or being attacked. 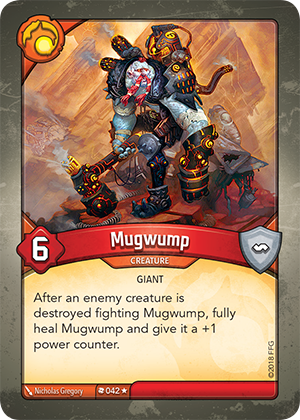 Does Mugwump need to survive the fight in order to resolve its ability? Yes. If either creature in a fight has a constant ability referencing the end of the fight (example: “after an enemy creature is destroyed fighting this creature…”), the creature must survive the fight to resolve the ability.